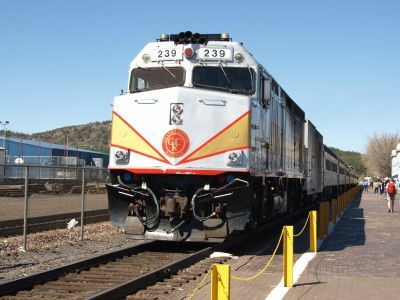 Seen prior to departure from Williams, AZ, on 4th May 2008, former Amtrak F40PH no 239 stands in the Grand Canyon Railway depot. Now converted to F40FH designation this loco has had its HEP unit removed and the trains power supply comes from a generator car coupled behind the locomotive. 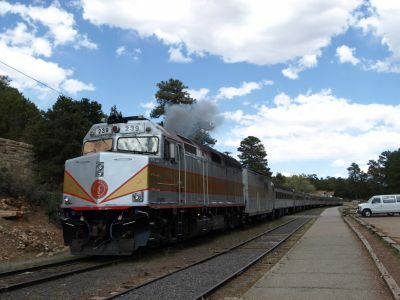 The Grand Canyon Railway (www.thetrain.com) operates 64 miles of former Santa Fe Railway trackage from Williams, AZ, to the South Rim of the Grand Canyon. The railway is a year round operation with a high season and low season service. In high season the railway operates two departures a day. The first is a steam hauled train and the second is a diesel hauled train. In low season there is a single daily departure hauled by a diesel locomotive. There are four classes of service on board the train starting with coach which is the bargain basement way of travelling. First class offers comfortable wide seats with a breakfast service of fruit and pastries on the way to the canyon and a snacks service on the return. At seat bar service is available at a charge and offers beer, wine, spirits and cocktails. Dome class service offers seating in dome cars with the added benefit of a better view of the desert landscape and mountains. Food and drink service is the same as first class. Finally, Parlour class offers the most exclusive seat on the train in a fully restored Parlour car which includes an open air platform at the rear of the train. Comfortable armchair style seating and the freedom to move around the car between the platform and your seating gives a feeling of top class travel. The private bar is available for at seat service of drinks and food service is also available throughout the journey. Various packages are available from the one day round trip to a multi day package including white water rafting on the Colorado River in the base of the Canyon and a hike along the Bright Angel trail. Accommodation is provided as part of this package in the El Torver Hotel at the Grand Canyon. Full details are available on the railways comprehensive website. Amtrak's Southwest Chief between Los Angeles and Chicago calls at Williams Junction where a shuttle bus will collect passengers for the Grand Canyon Railway. The Westbound train (from Los Angeles) calls at 4.20am and the Eastbound train (from Chicago) calls at 9.05pm. Accommodation can be booked in the Grand Canyon Railway hotel either direct with the railway or via one of the many travel websites. Passengers booked into the hotel, who arrive off the early train, can wait in the hotel's lobby where coffee is available. If rooms are available you will be allowed to check in when you arrive however this cannot be guaranteed during peak season. Breakfast can be taken at either Max and Thelma's Diner or at one of the many diners located in Williams itself, this being a short walk from the Railway Depot. The ticket office opens at 8.00am where you can collect pre ordered tickets and confirm bookings on other activities whilst at the railway. For an additional charge a coach tour of the rim of the canyon is available. This package includes lunch at one of the restaurants at the South Rim and then the coach takes you on to the many vantage points along the rim, giving extensive views of the canyon. The coach delivers you back to the train depot about 1 and 1/2 hours prior to the trains departure giving plenty of time to look around the site and take photo's of the train. Start up time. Grand Canyon Railway 239 bursts into life prior to working back to Williams, AZ, on 4th May 2008. Once tickets have been collected, time is available to look around the extensive gift shop before a Wild West Show takes place half an hour before departure of the train. Boarding is when allowed by staff who wait at each door of the train. Tickets have seat reservation numbers printed so it is easy to find your seat. The journey is across a mainly desert landscape and is made at a leisurley 40mph although some stiff grades on the route can significantly reduce this speed and increase the noise level from the front. Arrival at the Grand Canyon depot is via a wye where the train draws forward into the wye and then reverses into the station. If you are taking the coach tour then a coach number will be given to you by on board staff and the coaches wait in the coach park area next ot the depot. It is a most enjoyable journey although whether you enjoy the on train entertainment from singers with guitars really depends on your taste in music. On the return, a staged train robbery adds to the general amusement where the cowboys from the morning wild west show turn up and relieve you of dollars for railway charities. Overall this is a real experience and should be included in any itinerary which takes you across America.